Bhubaneswar : CESU PRO Golak Bihari sahu was felicitated by Pragatisila Lekhaak Sangha of the state for his writings to create awareness . He was awarded with merit certificate and memento by Hon’ble Minister Sj. Niranjan Pujari , Sj.Suryonarayana patro and Sj. 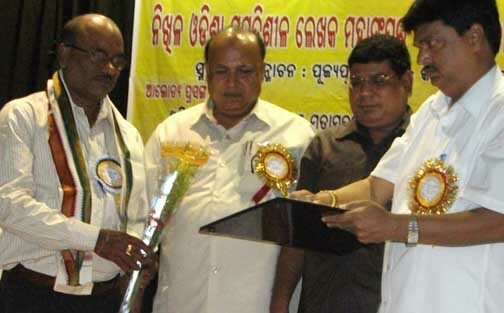 Prafulla samal in a function held at Jayadev Bhawan last week . His works in Library and information science and various articles for educating electricity consumers as well as for public earned this honour . His legal publication Electricity Laws in Orissa is the unique work after electricity reform . Among others kanduri Das , Partha sarathi , Pradyumna Mohanty and Pravat Kumar Nanda were present in the felicitation function .